More than 30,000 fans packed into a cold and windy Suzuka on Sunday (March 19), to watch the opening round of the 2006 Super GT Championship. They would see 39 cars take the start but sadly that wouldn’t include either the Team Goh GT500 Maserati MC12 or the GT300 Ford GT: the Italian car has now been withdrawn from the series, while the big American supercar arrived at the circuit but was not ready to take part in qualifying and therefore could not start the race. Qualifying had been dry, but the Super Lap procedure took place on a wet track, and produced a grid headed by the Arta and Takata Hondas, followed by the Motul and Xanavi Nissans, then, completing the pairs, the two Lexus of the Open Interface and Cerumo teams. The engine of the debuting #2 Privee Zurich/Apple Mooncraft Shiden, sixth on the grid in the GT300 class, failed to fire up for the formation lap and the exciting newcomer had to start from the pitlane. The #12 Calsonic IMPUL Z went off the course at the first corner, Kazuki Hoshino returning to the track dead last in the GT500 class. At the end of the opening lap, the order was the pole sitter #8 NSX driven by Ralph Firman in the lead, followed by Lotterer in the #36 Open Interface Lexus SC430, Ryo Michigami in the #18 NSX, Satoshi Motoyama in the #23 Nissan Z, Yuji Tachikawa in the #1 Lexus and Sakon Yamamoto in the #22 Nissan. Lap 2 and the #32 Epson Honda went wide and into the gravel at the first corner. Again the car regained the circuit but lost plenty of ground to the pack. The gap between Firman and the second-placed #36 Lexus (below) was down to a nose-to-tail fight for the lead. Lap 8 and the #23 Nissan running in fourth was badly baulked by backmarkers and was passed by the #1 and #22 cars. Then on lap 17 the #1 Lexus got right onto the tail of the #18 NSX into the Hairpin Corner, cut across the running line of the NSX, finally overtaking the Honda and moving into third at the next corner. The #22 Nissan also moved in on the #18 car, and slipped past on lap 20. After 20 laps, the top five runners were 8, 36, 1, 22 and 18 – Firman, Lotterer, Tachikawa, Yamamoto and Michigami (or Honda, Lexus, Lexus, Nissan and Honda). The #23 Nissan, after getting out of traffic, picked up the pace and was closing in on the #18 Honda for fifth. At the end of the 21st lap, the first of the GT500 class to pit for its routine stop was Akira Iida in the #6 Lexus, who turned over the wheel to Tatsuya Kataoka. Meanwhile, the #8 NSX and #36 Lexus battled for the lead on lap 22, Lotterer finally passing Firman on the outside at the Spoon Curve to take the place. The #1 Lexus also overtook the #8 Honda on lap 23, Firman making his routine pit stop on the next lap. Yamamoto in car #22 spun as he entered the pit lane, losing a chunk of time. The leading pair meanwhile, #36 and #1, chose to pit at the same time at the end of lap 24. Juichi Wakisaka took over the wheel of #36, the driver change going smoothly and the car rejoining the race in good time. But the #1 car lost several seconds in the pits, second driver Toranosuke Takagi rejoining but then outbraking himself into Turn 1 and losing more time as a result. 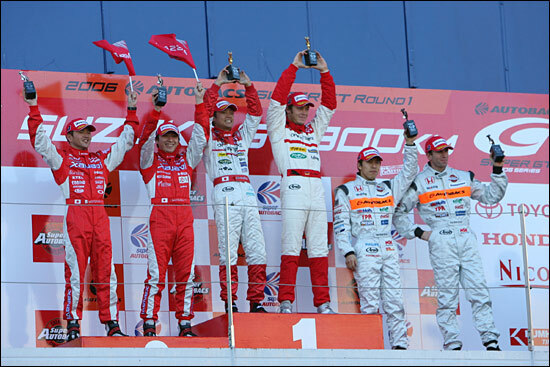 When the pit stops of the top runners were complete the top three were #36 Lexus (Wakisaka), #8 Honda (Daisuke Ito) and #23 Nissan (Tsugio Matsuda). Ito picked up his pace over the next 7-8 laps to close the gap on Wakisaka. Matsuda too drove hard, inching up on the #8 car. On lap 42, he caught Ito in the Chicane, and braking at the last possible second slipped by inside the #8 car to move into second in a magnificent pass, executed without incident. With 10 laps left, Matsuda set his eyes on catching the #36 Lexus at the head of the field. The gap between the two was opening and closing as traffic played its part, the difference between them falling to as little as 0.3sec at times. But Wakisaka stood firm and with only two laps to go, he built up a 1.5sec gap and kept the lead to the flag. So at the end of the 52 laps, the #36 Lexus SC430 (Juichi Wakisaka / Andre Lotterer) crossed the finish line first, followed by the #23 Nissan Fairlady Z (Satoshi Motoyama / Tsugio Matsuda) and third the #8 Honda NSX (Daisuke Ito / Ralph Firman) - the first three podium places of the season going to three different makes. 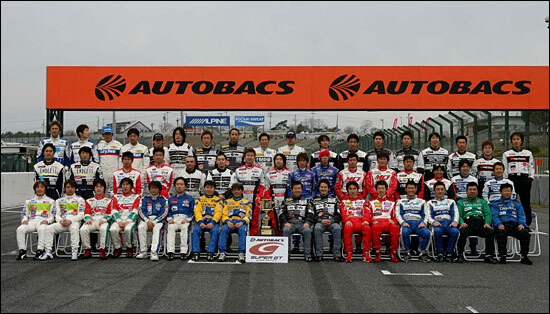 From the left, below, Motoyama and Matsuda for Nissan, Wakisaka and Lotterer for Lexus and Ito and Firman for Honda. In GT300 the pole position car, #46 Kichouhouzan DIREZZA Nissan Fairlady Z (lead off driver Kota Sasaki) slowly lost position from the start, the lead being taken by two Lamborghinis, the #87 Lamborghini Murcielago RG-1 driven by Koji Yamanashi and the #88 car driven by Marco Apicella. 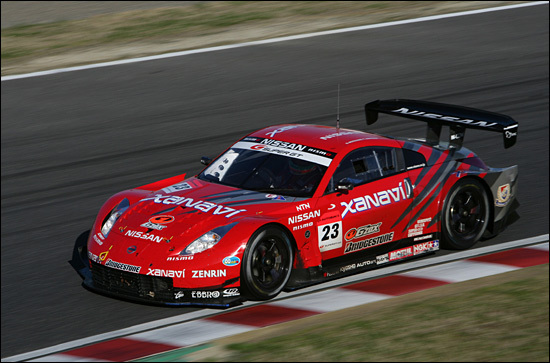 Behind them, a fight for third place developed between the #13 Nissan Z (Masami Kageyama) and #7 Mazda RX7 (Hiroyuki Iiri). But after a driver change where Tomonobu Fujii took the wheel from Kageyama, the #13 car went off the course. The GT300 class leaders, #87 in front and #88 running in second, took their routine pit stops one after another; the #87 car pitting first and the #88 car pitting one lap later. The #87 car experienced a problem as WADA-Q took over the drive, his Lamborghini being momentarily blocked by the car pitting in the next garage. The #88 car (Yasutaka Hinoi) meanwhile pitted and returned to the track without incident, taking the lead as a result, with #87 now in second. The finishing order looked set but with just one lap remaining, the #87 car suddenly pitted, perhaps due to worries over fuel shortage. After a quick stop, the car returned to the track, but the problem was not resolved and the car failed to complete the final lap. The #7 Mazda driven by Tetsuya Yamano took second and the #110 Porsche Boxster (Hideshi Matsuda / Ichijyo Suga), after running a steady fourth / fifth throughout the race, was third. Even though the #87 Lamborghini Murcielago (Koji Yamanashi/WADA-Q) did not finish after stopping on the final lap, a fifth place finish was still secure. 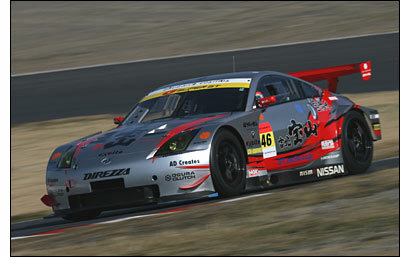 So then a debut win for the Lexus SC430 and a first win in GT racing for the Lamborghini Murcielago. 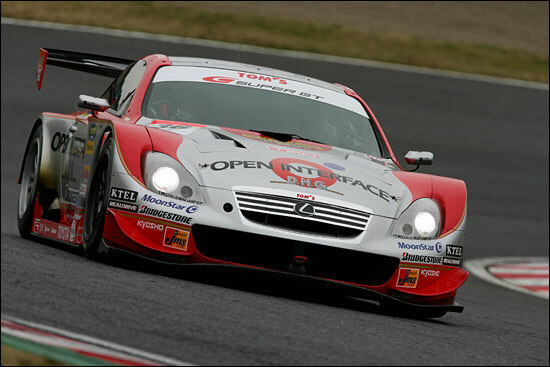 JLOC has participated in the JGTC since the inauguration of the series in 1994, and this is the team’s first win.